UNCASVILLE, CONN. – June 14, 2018 – In the midst of multiple historic charity sales in 2018, Barrett-Jackson is set to make history once again with the sale of the last-production 2018 Dodge Challenger SRT Demon and last-production 2017 Dodge Viper, which will be among the five vehicles sold for charity at the 3rd Annual Northeast Auction, June 20-23, 2018, at Mohegan Sun in Connecticut. The last Demon rolled off the production line in Brampton, Ontario, on May 30 and will be sold as a pair with the last Viper. “We are fortunate to have had the incredible support of our many partners and bidders who have helped us raise more than $102 million for charity over the years,” said Craig Jackson, chairman and CEO of Barrett-Jackson. “From selling the first current-model Ford GT at public auction to having President George W. Bush on the block for the sale of a 2018 Chevrolet Corvette Carbon 65, 2018 has already generated some amazing charity moments. We are absolutely thrilled with the opportunity Dodge has presented to auction two of the most powerful cars in the modern era in one package to support the United Way. In addition, we are excited to bring our yearlong Driven Hearts charity initiative to Mohegan Sun as we continue our efforts to raise money and drive awareness for the American Heart Association. 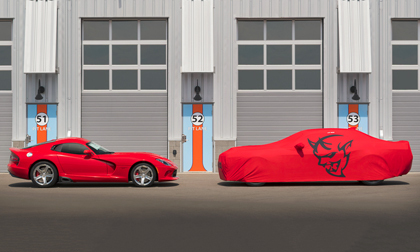 The Demon (Lot #3002.1) and Viper (Lot #3002) will be fully unveiled together for the first time in the Dodge exhibit at 11:00 am on Wednesday, June 20, during Preview Day/Family Value Day. The vehicles will be auctioned together as a pair at 3:00 p.m. on Saturday, June 23, with 100 percent of the hammer price benefiting the United Way. The 10-percent buyer’s fee will benefit the American Heart Association as part of Barrett-Jackson’s Driven Hearts charity campaign. The Demon, which set a Guinness World Record for the fastest quarter-mile production car (9.65 seconds ET/140 mph), features a roaring 840-horsepower engine and is the last of 3,300 units built, while the Viper sports a hand-built V10 engine, and a Viper Red exterior and black interior. The heartbeat of Barrett-Jackson’s four auctions in 2018 is the company’s yearlong Driven Hearts charity initiative to help raise funds and awareness for the AHA. Highlighting the initiative at the Northeast Auction is the sale of a 1988 35th Anniversary Chevrolet Corvette (Lot #3003), which was donated by Charmaigne and Darrell Pullen (story). The Corvette matches the car donated by Carolyn and Craig Jackson that previously sold in Scottsdale and Palm Beach. The initiative will once again be in full force during the auction, with Craig Jackson’s Driven Hearts Bugatti Veyron on display and signage throughout Mohegan Sun helping raise awareness for heart health. In addition, a new commemorative license plate with the letters F.A.S.T. will be on all auction cars and available for purchase – promoting the acronym that is a key part of the AHA’s stroke awareness efforts: If you see someone with (F)ace drooping, (A)rm weakness or (S)peech difficulty, it’s (T)ime to call 911. The Corvette will be sold at 5:30 p.m. on Saturday, June 23, and 100 percent of the hammer price will benefit the American Heart Association. The first charity sale of the week is on Friday with special guest Wayne Carini – best known for his role as host of the TV show “Chasing Classic Cars” – in attendance for the sale of a 1971 Chevrolet Corvette T-Top Stingray (Lot #3000). The vehicle will be auctioned at 3:30 p.m. on Friday and 100 percent of the hammer price will benefit the Klingberg Family Centers – a Connecticut-based nonprofit dedicated to helping children and families whose lives have been traumatized by abuse in various forms, severe family problems and mental health issues. At 5:30 p.m. on Friday, Craftsman, the preferred hand tool of Barrett-Jackson and the Barrett-Jackson Garage, will support the sale of a 1970 Chevrolet C10 (Lot #3001) with 100 percent of the hammer price benefiting the American Red Cross Connecticut. Carini will be back on the auction block to help with the sale of the rotisserie-restored short-bed pickup, featuring an original 350ci V8 engine backed by an automatic transmission. Barrett-Jackson’s 2018 Northeast Auction is June 20-23, 2018, and will be the first event inside Mohegan Sun’s new 125,000-square-foot Expo Center. Preview Day/Family Value Day is Wednesday, June 20, with the collector car and automobilia auctions beginning Thursday, June 21. A full schedule of events, including TV times, is available at Barrett-Jackson.com. The docket is now live; for information on becoming a bidder, go to www.Barrett-Jackson.com/bid. Consignments for the 2018 Las Vegas Auction are now being accepted, to submit an application, click here. Also, follow Barrett-Jackson on Facebook, Instagram, LinkedIn and Twitter for the latest news and information heading into the 2018 Northeast Auction.